I’m not the only one that has had that uncomfortable experience of not knowing a friendly face. A man named Cleopas had a similar encounter with Jesus. That same day two of Jesus’ followers were going to a town named Emmaus, about seven miles from Jerusalem. They were talking about everything that had happened. 15 While they were talking and discussing, Jesus himself came near and began walking with them, 16 but they were kept from recognizing him. Luke 24:13-16 New Living Translation. I’ll bet that Cleopas had the same inner debate when Jesus joined him on the walk from Jerusalem west to Emmaus. A “This-guy-looks-familiar-to-me-but-I-don’t- know-who-he-is,” kind of question. What could have happened in three days to make Cleopas blind to who Jesus was? The simplest explanation is that Cleopas was too immersed in his pain, too distracted by his worry, and too disappointed by what seemed like a total failure of Jesus’ plan. Any one of those “too’s” was enough to create amnesia in a wearied mind. However, there’s another possible explanation as well. Perhaps Cleopas had given up on faith. Maybe he couldn’t see Jesus because he didn’t believe that Jesus could possibly be present with him on this journey. Luke wrote that the report by some of Jesus’ disciples of his disappearance from the tomb “seemed to them an idle tale, and they did not believe them,” Luke 24:11. I never did figure out who the individual was that waved to me. Fortunately Cleopas did. Luke said that when Cleopas sat down to eat a meal with Jesus the blinders came off his eyes. 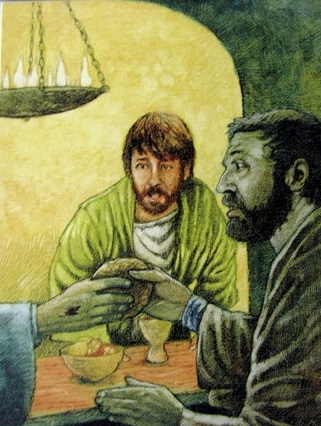 As Jesus took bread and broke it, Cleopas remembered. He remarked to his nameless friend, “Didn’t our hearts burn within us while Jesus was talking to us on the road?” Luke 24:32. How is anyone ever able to have a Cleopas moment? Cleopas did not allow his disappointment about the crucifixion to silence his faith. Clearly, if he had abandoned faith, he would have called Jesus an imposter or a figment of his imagination, but certainly not a once-dead person now living. Cleopas must have also believed that there was something larger going on in the Universe. Something that may not always be apparent to him. Even the writer of Hebrews said that common hospitality has sometimes created the opportunity to entertain angels, Hebrews 13:2. I think Cleopas must have been changed by the experience. Changed in the way he noticed people. Changed in the subtleties of behavior and gesture that characterize different people. Above all, changes in the way he listened, making sure not to ignore the weight of words. Maybe if I had payed closer attention I would have recognized the person at the restaurant. ← Previous Post I’m the greatest!